Reestablishing stability in South Sudan will require peacemaking at the community level, demilitarization, and security sector reform. Internally displaced persons in South Sudan. Photo: European Commission DG ECHO. The eruption of violence in South Sudan on the fifth anniversary of the country’s independence has reopened the wounds of the December 2013 conflict that resulted in 50,000 deaths and displaced hundreds of thousands of people. On its surface, this crisis is another episode of the ongoing political competition between President Salva Kiir and his rival, Riek Machar. However, this cycle of violence, barely three months into yet another power-sharing deal, underscores the need to urgently address the structural roots of conflict in South Sudan beyond the immediate security arrangements. South Sudan’s problematic transition has been exacerbated by a dominant class of competing military elites who have used their control over regular and irregular forces to utilize the political process as an avenue through which to gain personal wealth, influence, and power. They also exploit long-standing social tensions, which frequently results in political grievances exploding into deadly violence with pronounced ethnic undertones. The practice dates back to the civil war between Sudan and the Sudan People’s Liberation Army (SPLA), during which a complex web of tribally organized militias, many of them supported by Khartoum, held sway over extensive swaths of territory. The most serious factional fighting among Southerners occurred in 1991, when a dispute between Riek Machar, then a senior SPLA commander, and the movement’s founder, the late John Garang de Mabior, turned violent. Over 2,000 Dinka civilians in Garang’s home town of Bor, were allegedly killed by Nuer fighters loyal to Machar. In the aftermath, Machar’s followers broke away from the Sudan People’s Liberation Movement (SPLM), driving a deep wedge between Dinka and Nuer elites which persists to this day. 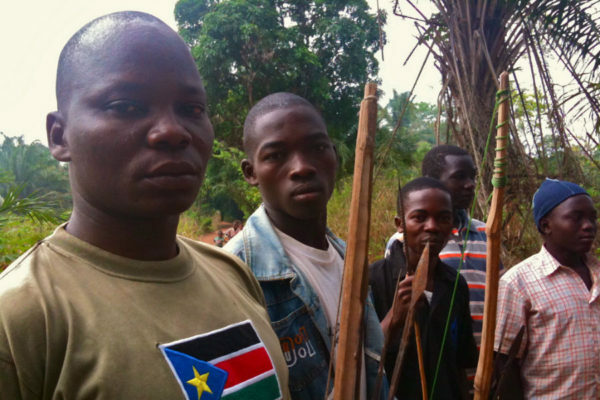 Members of the Arrow Boys militia in Western Equatoria, South Sudan. Photo: Guy D.
The 2005 Comprehensive Peace Agreement between Khartoum and the SPLM outlawed militias allied to either side. The vast majority of these armed groups were not included in the process until 2006, when about 60,000 were absorbed into the SPLM/A, an initiative of Garang’s successor, Salva Kiir. Integration, however, proved elusive, primarily because returning factional leaders retained extensive control of their forces, now nominally inside the national army. Furthermore, the vast majority of militias remained intact and were deployed close to their home areas as a compromise in exchange for peace. In South Sudan, young men have usually been organized into regiments based on age, serving as military manpower for traditional leaders, some of whom doubled as commanders. These bosses also became political leaders, which often caused political disputes to spill over to the military and take on ethnic undertones. This fusion of traditional, political, and military roles meant that governance in SPLM/A-controlled areas during the war was dominated by military leaders, a structural edifice that continued into the transition to independence. In response to this structural dysfunction, community-based peacebuilding initiatives emerged. For instance, following the 1991 crisis, the South Sudan Council of Churches launched a peace process that pacified Dinka and Nuer traditional leaders and communities, paving the way for the eventual reconciliation between Machar and Garang and the reunification of the SPLM/A in 2002. This was replicated in other areas by groups working directly with communities and age-set regiments to demobilize their fighters. As fighters turned away from the battlefield, the power of commanders and politicians waned considerably, thereby enabling higher-level peacemaking to take root. Over a period of 12 years, more than 30 local peace agreements were negotiated this way. However, the sheer number of militias that mushroomed over the years overwhelmed these efforts. Furthermore, the power of authentic traditional leaders has waned, and young fighters, who derive their status from their sheer ability to instigate violence, are less deferential to traditional and religious authority. 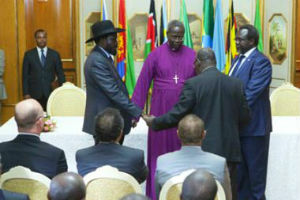 Additionally, the longstanding policy of providing unconditional amnesty and military and government positions in exchange for peace has had the unintended effect of creating incentives for rebellions, evidenced by the astronomical rates of defections and re-defections and the ever-shifting alliances that continue to be a familiar feature of violence in South Sudan. Several lessons can be gleaned from the predicament facing South Sudan. First, its myriad crises are rooted in structural factors dating back to the civil war against Khartoum, many of which carried over into the transition to independence. As such, initiatives that focus on the immediate crisis without taking these deeper problems into account are unlikely to break the cycle of violence. Second, ethnicity per se is not the problem. Rather, it is the manipulation of ethnicity for political purposes and its efficacy in mobilizing vast numbers of fighters that gives South Sudan’s multiple conflicts their ethnic undertones and pose a serious threat to civilians. Third, the dominance of a highly fragmented military elite operating in a climate awash with weapons and the culture of using force to build ethnic constituencies have elbowed civilians and communities out of the political process. Human Security Baseline Assessment for Sudan and South Sudan, “Conflict in Western Equatoria: Describing Events through 17 July, 2016,” Special Report, Small Arms Survey, July 2016. Kate Almquist Knopf, “The Situation in South Sudan,” testimony before the U.S. Senate Committee on Foreign Relations, January 9, 2014. Kate Almquist Knopf, “Fragility and State-Society Relations in South Sudan,” Research Paper No. 4, Africa Center for Strategic Studies, September, 2013. Paul Murphy, “The Delicate Practice of Supporting Grassroots Peacebuilding in Southern Sudan,” Conciliation Resources, 2006.